Of course, players may change balls at will between the play of two holes (unless there is a One Ball Condition of Competition), as they do not have a ball in play at that time. 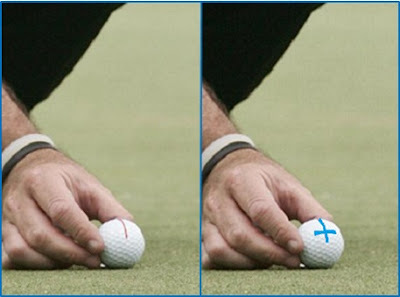 When a ball is marked and lifted from the putting green, put in a pocket and then a different ball is replaced at the marker and played. This precludes a player from having a favourite ball for putting only. When a ball is lifted from a putting green and is accidentally dropped or thrown somewhere from where it cannot be retrieved, e.g. in deep water of a water hazard. When a player notices that they are playing the same brand and number of ball as another player in their group and they change their ball, so as to easily distinguish between them, Decision 15/6.5. When taking relief from a water hazard, Rule 26-1. When playing under penalty of stroke and distance, Rule 27-1, even if the original ball is not lost or out of bounds. When the player deems their ball unplayable under Rule 28, whether or not the original ball has been retrieved. When a ball has come to rest in a place that is dangerous to the player (e.g near a poisonous snake or a bees' nest) and they are permitted to drop a ball away from the danger, Decision 1-4/10. When it has been determined that a ball has become unfit for play, Rule 5-3. When a ball has been lifted under the Rules, due to suspension of play, the player may replace the original ball, or a substituted ball, Rule 6-8. When a ball to be dropped or placed is not immediately recoverable by a player after they have caused it to move; e.g. if it was accidentally kicked into water; because it is in or on a movable obstruction, Rule 24-1, or an immovable obstruction, Rule 24-2; because it is in an abnormal ground condition, Rule 25-1. Note that there is no penalty is a player lifts a ball that has been incorrectly substituted and replaces it with the original ball, provided they have not made a stroke at it. Rule 20-6 states. A ball incorrectly substituted, dropped or placed in a wrong place or otherwise not in accordance with the Rules but not played may be lifted, without penalty, and the player must then proceed correctly. What a great Christmas present! Have 1,998 questions, answers, references and explanations (where necessary) on the Rules of Golf available wherever you are, by purchasing my two eBooks and having them downloaded on your smart phone, tablet, eReader, or other digital device. Any time you have a few minutes to spare you can test and educate yourself on the Rules, which will help you avoid penalties and take advantage of the many situations where knowledge of the Rules can save you wasted strokes. Let me know if you are purchasing as a present for someone else and I will be gladly extend my copyright permission to that/those persons. Click Here. There are other books available at this link on my ‘Rhodes Rules School’ web site. If you click on any book at this link you will enter the Amazon store through my associate account and I will receive a small commission on anything that you purchase. I can assure you that your purchases will not cost you a cent more by entering the store through this link.